Faux Dichro, spectacular liquid glass, is applied to pre-cut patina discs for a unique look. The many shapes, sizes and colors of patina discs can be used to create bracelets, necklaces, earrings and much more! This is a combination that can't be beat! Place a colored metal disc on a flat level surface with a piece of waxed paper underneath in case the liquid glass spills over the edge of the disc, or possibly use a raised surface such as a bottle cap underneath the disc. Cut luminous elements in a desired shape to go on a colored metal disc. Or you can use a special shaped hole punch. You might want to use fewer elements on a colored background, to let color show through, as opposed to something lacking color where you might want to use more luminous elements to cover the surface. Save any snips not used for other discs; that way none get wasted. Put the liquid glass on top of the disc with the luminous elements. 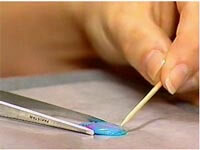 Use a toothpick to spread the liquid glass out to the edges of the disk to get a thin even layer. Pop any bubbles with the toothpick. If you need to add a second layer of the liquid glass, allow a drying time of 1-1/2 hours between layers, and after the last coat wait at least 3 hours before you use the disk. After the first side is dry, check to see if any liquid glass spilled over the edge of the disk. If there is any excess, use scissors to cut around the edge of the disk and then file any rough edges smooth using either fine sandpaper or a finger nail file. If liquid glass gets into the hole of the disk, pierce through the hole with a needle. Decorate the other side of the disk repeating Steps 2 and 3. When the disk is completely dry on both sides, place a dot of glue on the disk wherever a flat back crystal would add sparkle. Use the dop stick to pick up the crystal and place it over the dot of glue. It takes 10 - 15 minutes for the glue to set; the glue dries clear. Flip the disk over and glue a crystal on the other side. Follow Steps 1 - 7 for all the disks being placed on the bracelet. Using two pairs of pliers, open a jumpring, then slip on a decorated metal disk and a swivel clasp. Close the jumpring. For added security apply a drop of glue to the seam of the jumpring after it is closed. Wait for the glue to dry before attaching the clasp to the bracelet. Repeat Step 9 for all the disks. 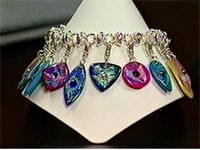 Decide which order to place the disks onto the bracelet. Use the swivel clasps to attach the disks to the appropriate link in the bracelet. Repeat for all the metal disks.